Cranes Today: The only truly independent international title for lifting Cranes Today celebrates 40 years in print in 2012. It is the original magazine for the lifting industry, and the only independent international title in its sector. 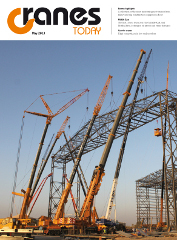 It offers a mix of regional and sectoral market reports, business, regulatory and project news, and new product information for everything from slings to supercranes. It is distributed every month to more than 17,000 lifting industry professionals around the world. It has the highest proportion of readers directly requesting their own copy. It’s readership is dominated by crane owners and construction contractors.